"This has no regional precedent," José Miguel Vivanco, director of Human Rights Watch's Americas division, told a press conference in Miami on Thursday to promote the group's report on 'The Venezuelan Exodus,' which recommends region-wide legal protection for all Venezuelans. Latin American nations need to come together to create a unified region-wide plan to grant temporary legal status to Venezuelans fleeing their country in what is now "possibly the gravest migration crisis in contemporary Latin American history," according to Human Rights Watch. "This has no regional precedent," José Miguel Vivanco, director of Human Rights Watch's Americas division, told a press conference in Miami on Thursday to promote the group's report on 'The Venezuelan Exodus,' which recommends region-wide protection for all Venezuelans, including work permits and suspension of deportation. It also recommended economic sanctions against key Venezuelan officials implicated in serious human rights abuses. Vivanco was speaking a day after the Secretary General of the Organization of American States, Luis Almagro, said that different countries should grant legal status to Venezuelan migrants while working to integrate them socially and economically. A group of 11 Latin American nations meeting in Ecuador on Tuesday called for increased aid to assist thousands of Venezuelan immigrants fleeing the economic collapse of their homeland. The declaration, signed by officials from Argentina, Brazil, Ecuador, Costa Rica, Colombia, Chile, Mexico, Panama, Paraguay, Peru and Uruguay, followed a two-day meeting, also called for aid from regional multilateral organizations, such as the United Nations. "The fact that they are willing to deal with the problem as a regional crisis we see as an advance," said Vivanco. "We are talking about two million people," he added, referring to official estimates of the size of the exodus. While this was "an important step," Vivanco said the region still needed to work out a concrete set of universal criteria for accepting the Venezuelans so that the migrant children can get schooling and their parents can find work. "They are fleeing with just the clothes on their backs, by foot, with small children, with the elderly, traversing Latin America to escape this situation of famine, lack of medicine, a lack of any future, and the overwhelming violence and insecurity ... under this dictatorial regime," he said. "In the face of an extraordinary and exceptional situation the response needs to be equally exceptional," said Tamara Taraciuk, the Argentine author of the exodus report. "We already have the diagnosis, what we need now is to take the next step to find the way to receive the Venezuelans in a dignified and humane way." Almagro also announced the creation of a working group that will visit the borders and areas where displaced Venezuelans are settling. "The exodus is causing significant pressure for several countries that, despite their good intentions, have limitations when attending those who come in," said Almagro. "They can't do it alone, no country can do it alone. It must be a collective action with a shared responsibility approach," he added. A statement after the Ecuador meeting urged the government of President Nicolás Maduro to ensure that citizens have identification cards and passports so they can travel freely. However, Venezuela did not participate in the Ecuador meeting despite being invited, and Taraciuk said it was "absurd" to expect any cooperation from the Maduro government whuich both created the crisis and denies that it exists. Venezuela’s ruling Socialist Party has dismissed the migration figures, alleging that they are part of an international campaign to justify foreign intervention. 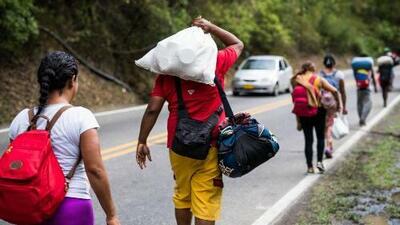 Maduro says no more than 600,000 Venezuelans have emigrated in the last two years. Maduro has rejected offers of international assistance. Instead, he has launched a "Return to the Homeland plan", with the U.N. to provide technical support for people who want to return.